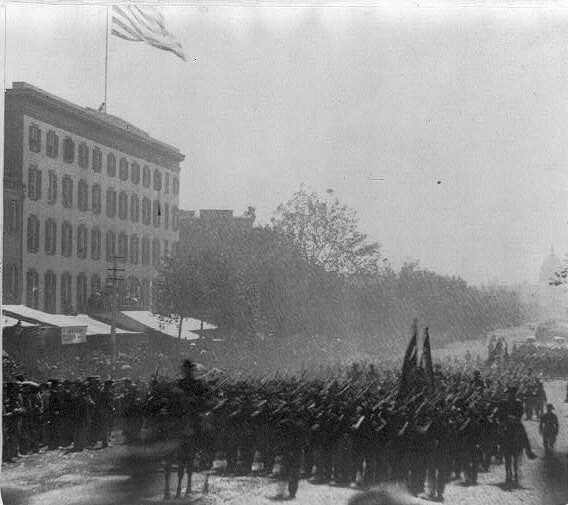 Yesterday marked the 150th anniversary of the Army of the Potomac’s Grand Review through the streets of Washington, D.C. William Child, Surgeon of the 5th New Hampshire Volunteer Infantry, who had just weeks earlier witnessed the assassination of President Lincoln in Ford’s Theater, was there to participate in the parade. With the amount of activities taking place it took him two days to complete his letter and place it in the mail to his wife Carrie. The past few weeks had been a hard transition for Child. Not only had he experienced the return to army life, witnessed the assassination of Lincoln, and had an arduous journey back to the front, the elation of the end war but the unconfirmed end of his service put both Child and his wife on an emotional journey. By the end of his latest letter, his melancholic yearnings from home had returned to his pen. Follow Child as experienced the Grand Review 150 years later. Yesterday and to-day has and is to be the grand review of the army. Our corps was reviewed yesterday. We passed before Gen. Grant—President Johnson and a large number of Maj. and Brigd. Genl. It was all very grand, I suppose. But being in the column I could not realize how great an army we had. I will send you a paper with a full account of the whole affair. I did not stop in Washington. We just marched over the river—up the Avenue past the President’s House—on to Georgetown—across the river to camp again. I have not been able to visit Washington since our arrival here—and have visited Alexandria once. I have been very quiet in my quarters. In fact I am becoming weary of this dull camp life—and hope we shall soon have a change. It is now the report that the second corps will march to Baltimore—then to be sent home on a sixty days furlough with half pay and half rations. Another report is that the 5th N.H. will be retained in the service another year. What will really be done with use I know not—nor do I think any one beside the Sec. War can tell. I think I can get home within a few weeks—but the Col. is determined that I shall not go. With our present pay I can earn more than I can at home—but yet I think it would be best for me to be at home since I do not intend to follow a military life. Please write soon—tell me just how you are. Detail of a Stereograph showing the Grand Review of the Union Army veterans on Pennsylvania Avenue, Washington, D.C., May 23-24, 1865. Courtesy Library of Congress. I am currently a primary and secondary educator with a public school district in northeast Ohio. Previously, I was the Education Programs Coordinator for the Gettysburg Foundation, the non-profit partner of Gettysburg National Military Park, and have been a seasonal Park Ranger at Gettysburg National Military Park for eight years. During that time, I have given numerous programs on the campaign and battle for school groups, families, and visitors of all ages. I received his BA in Instrumental Music Education from Youngstown State University where he studied under the famed French Hornist William Slocum, and am currently finishing his MA in Military History with a Civil War Era concentration at American Military University. I have also studied under the tutelage of Dr. Allen C. Guelzo as part of the Gettysburg Semester at Gettysburg College. I reside with my wife, Sarah, in Boardman, Ohio. This entry was posted in Armies, Civil War Events, Civilian, Common Soldier, Memory, Personalities, Photography, Sesquicentennial. Bookmark the permalink.